A themed console, carrying case and a digital download of the game included! Nintendo has announced a special edition Nintendo Switch console bundle for the upcoming Diablo III: Eternal Collection, launching on November 2nd. The included Diablo III themed case. 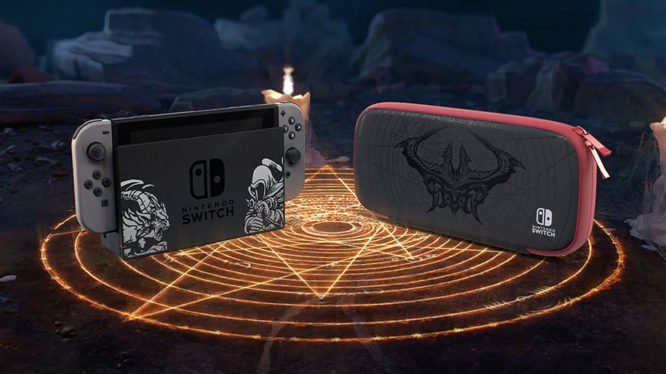 The bundle features a Nintendo Switch console decked out with grey Joy-Cons and Diablo III themed decals grace the dock and backplate of the console itself. Also included in the bundle is a Diablo III carrying case featuring the titular demons face as well a download code for Diablo III: Eternal Collection. The Eternal Collection includes the base game and all the previously released DLC. Additionally, fans can expect Nintendo Switch exclusive content like Ganondorf’s Armour to use in-game. The back of the Diablo III limited edition Nintendo Switch. The limited edition console will be a GameStop exclusive in the USA and will retail for $359.99. Nintendo of Europe also announced plans to release the bundle via their Twitter feed but there is currently no confirmation on price or retailers. There’s no word yet on whether Japan will see the Diablo-themed console. Blizzard’s dungeon crawler is the first third-party game to receive a themed console with Pokémon Let’s Go! and Super Smash Bros. Ultimate bundles limited edition bundles announced earlier this year. The Diablo III limited edition Nintendo Switch bundle will release alongside Diablo III: Eternal Collection on November 2nd, 2018 for $359.99. Untold riches await the worthy hero! Available to pre-purchase from the Nintendo eShop today! US Retailer Target lists the game with a believable launch date.